The Mechanical Oscillator is perfect for performing existing harmonic motion demonstrations or creating new ones. 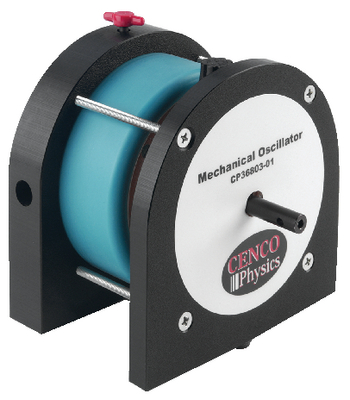 The oscillator provides mechanical vibrations for driving strings, springs, ripple tanks, Chladni Plates, or other experiments. The input is fuse protected to prevent inadvertent damage. Rubber bumpers under the base and on one side allow for both vertical and horizontal positioning. The base can be mounted on a standard 1.3 cm rod in the vertical and horizontal direction. Connect accessories by plugging them into 4 mm horizontal and vertical holes in the drive shaft. Instructions are included. A Oscillator Amplifier and a Function Generator are required but not included.